This salsa is a multi-purpose fun food! It's delicious on rice crackers or chips, but my favourite way to eat it is topped on steamed rice and Chinese food. Combine all the ingredients together and you're done! Depending on what herbs you choose for this salsa, you'll give it a completely distinct flavour. The way I first tasted this garnish was at a Chinese restaurant, where they used green onion, which went deliciously with the steamed rice and braised tofu with bok choy. At home I like to make it with dandelion leaves or parsley for their detox qualities. And with chips or crackers, the cilantro is really aromatic and delicious (and also complements Asian cuisine wonderfully). 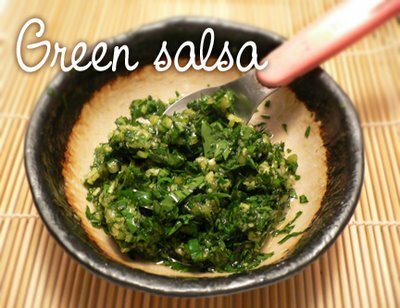 Or, try a combination of herbs like cilantro with green onion or dandelion with parsley. Great as a soup garnish, too!